Permanent electro magnetic TECNOLIFT series clamp, carry and drop the load with ease, always working above the load, without compressing nor deforming it. The range consists of several models of magnetic lifters, to meet every need of handling ferrous loads for different companies. Telescopic beams TM series for handling sheet metal up to 20 m; fixed beams of the series BF BFS for strips; tilting TB beams for sheet metal in vertical warehouses; SML modules for rolled blocks. TP for profiles and beams; TU for single pipe or rolled; TT for loading and unloading cutting beds; EM for rod bundles. SMH modules for forged blocks; RD and RDP for round pieces; CH and CV modules for coil handling; BL modules for billets. BR and BRW for slabs on cranes; RO for rails. Does not leave magnetic residue in the load being handled. The reversible permanent Quadsystem technology with double magnets uses electric power only for small cycles of several seconds respectively in the “MAG” stage of magnetization and demagnetization “DEMAG”. A permanent-electro magnetic system is secure, as it is not affected by power failures. Does not require backup batteries. The load remains clamped with constant force, indefinitely and can be released only to the ground. 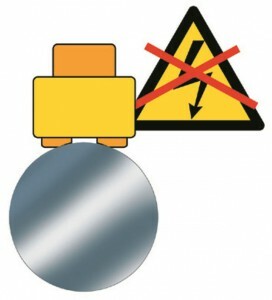 The neutral crown form ensures absence of magnetic flux leakage and potential interference with adjacent metal objects to the load. 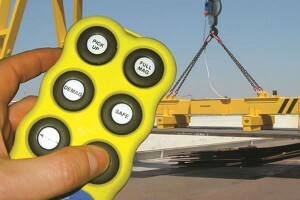 A single operator, remaining at a safe distance from the load, the activation of the controller allows clamping, handling and release operations. This does not require additional staff for its installation and for slinging loads. Our modules also optimize workspaces: Do not require clearances or gaps between a load.